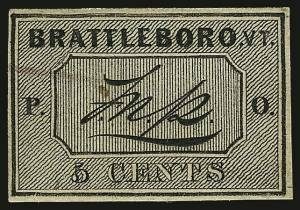 On July 1, 1847, Brattleboro postmaster Frederick Palmer had the idea of putting adhesive on the back of stamps, and so he produced and sold the first gummed postage stamp in America, now known as the 1847 Brattleboro Postmaster’s Provisional stamp. New England is one of the oldest and most historically rich areas of the nation. Famous events such as the pilgrims founding Plimouth Plantation and Paul Revere’s midnight ride took place in Massachusetts. New Hampshire planted the first potato in America, Maine introduced the nation’s first sawmill, and Vermont produced the nation’s first gummed postage stamp. 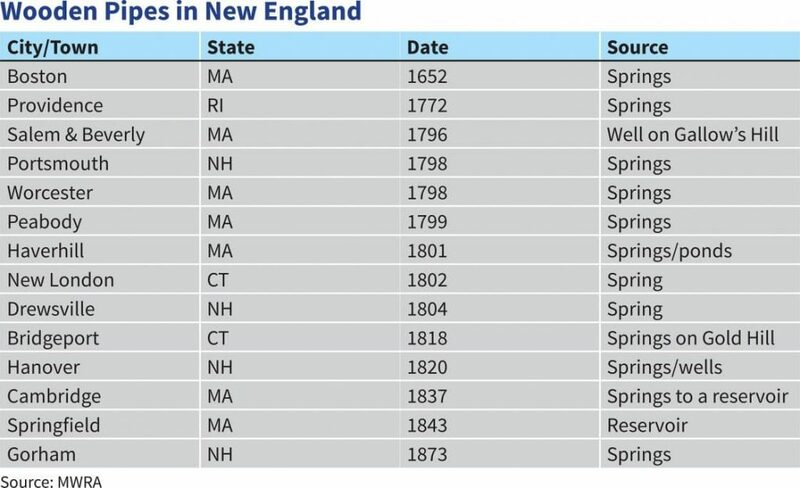 Connecticut has the most “firsts” of any state in the nation including the first newspaper, submarine, and hamburger, while tiny but mighty Rhode Island was the first colony in the nation to declare independence from Britain. 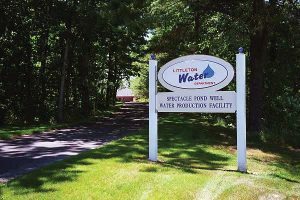 New England also boasts another first: it is home to the nation’s first water distribution systems. Wooden pipe and fire plug from colonial Boston on display at the Waterworks Museum, Boston, MA. Boston, Massachusetts became home to the nation’s first waterworks in 1652. Distribution pipes at that time were made of wood, constructed from bored-out logs from the area’s plentiful hemlock and elm trees and attached together with pitch, tar, or iron hoops. While this rudimentary distribution system did supply some of the area’s residents, it was mainly used for fire protection as homes during that time — constructed of wood and heated with fireplaces —were particularly prone to fire. It was over a century before other New England cities began installing wooden distribution pipes. Providence, Rhode Island, Portsmouth, New Hampshire, and Worcester, Massachusetts all laid wooden pipes during the late 1700s, and several other cities followed suit in the early 1800s. Contrary to some urban myths, wooden pipes are not still in use in any areas of New England today. 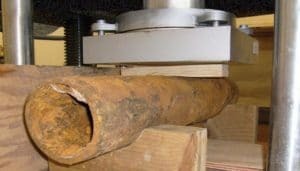 The high pressure from modern water systems would instantly split any existing wooden pipes. 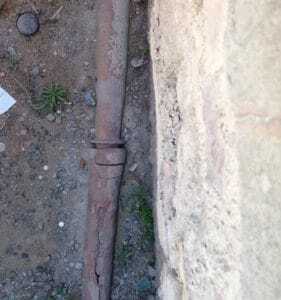 Wooden pipes that are occasionally unearthed during some construction projects were disconnected years ago. Wooden pipes were problematic for many reasons including warping and sagging, insect infestation, rotting, taste issues, and splitting. As iron became increasingly available during the early 1800s, cities began installing iron pipes. 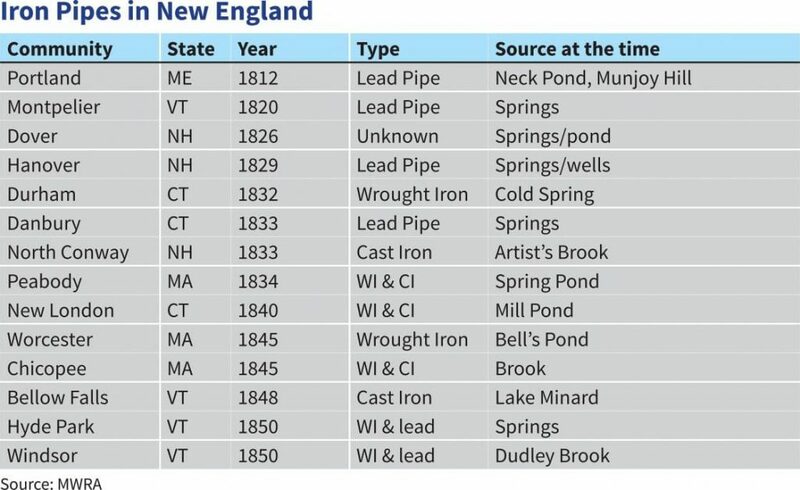 The first iron pipes in New England were installed in Portland, Maine in 1812, followed by Montpelier, Vermont in 1820, and in both instances the pipes were lead. Many other cities followed suit throughout the 19th century, utilizing wrought iron, cast iron, and lead pipe. In the 1950s, ductile iron piping was introduced and boasted the longevity of cast iron with the addition of increased strength, flexibility, and safety. It became widely used in the 1970s and it is still the material of choice throughout New England today. New England can be considered a pioneer of our nation’s water infrastructure. After all, distribution systems have grown from a few wooden pipes in Boston to the intricate, complicated underground infrastructure that we enjoy today. However, because much of the area’s infrastructure was laid so long ago, it has reached the end of its useful life. 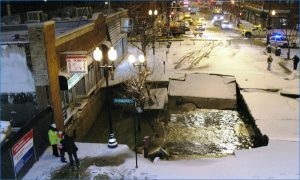 Water main breaks occur daily and are not only inconvenient to customers, they can also be dangerous, as evidenced by the November 2016 water main break in Boston, Massachusetts that caused manhole fires and forced evacuation of the area. Maintaining and updating our distribution systems is critical to the health and safety of our nation, its people, and the economy. But with limited budgets and resources, where do we start? 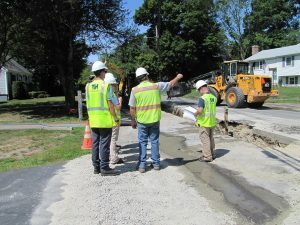 Tata & Howard provided design, bidding, and construction administration for a water main replacement in Milford, Massachusetts, identified in a Capital Efficiency Plan. Strategically prioritizing improvements is imperative to today’s water systems, as the rehabilitation and replacement of our nation’s buried infrastructure is an ongoing task. Asset management provides a roadmap for utilities, allowing them to maximize their limited infrastructure dollars by planning for the replacement of critical infrastructure over time. Tata & Howard’s Capital Efficiency Plan™ (CEP) methodology takes it one step further by combining the concepts of asset management, hydraulic modeling, and system criticality into a single comprehensive report. The final report provides utilities with a database and Geographic Information System (GIS) representation for each pipe segment within their underground piping system, prioritizes water distribution system piping improvements, and provides estimated costs for water main replacement and rehabilitation. 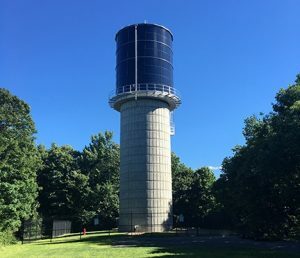 Tata & Howard provided water system distribution evaluation as well as design, bidding, and construction administration for a water tank replacement project in Paxton, MA. Since the firm’s inception in 1992, Tata & Howard has remained a niche firm with deep experience and expertise in the water environment, and has provided CEP and hydraulic modeling services for countless municipalities throughout New England. Tata & Howard has one of the largest pipe asset management databases of any consulting engineering firm in New England. In fact, we have data on over 5,000 miles of New England pipe, providing utilities with critical information about their systems such as condition and probability of failure of certain pipe cohorts. Water distribution systems have come a long way since the days of hollowed out logs providing fire protection to colonial Bostonians. The underground network of distribution pipes has grown astronomically and now incorporates safer, stronger, and more cost-effective materials. As distribution systems are updated and expanded, it is critical that accurate, up-to-date information is available to water systems so that they may invest their limited capital wisely. Water mains play a crucial role in modern day civilization and contribute greatly to public health. Water mains have been in use for over 4000 years, and, through the years, huge strides have been made in the engineering and construction of this critical infrastructure. The first known underground water mains were constructed by the ancient Minoan civilization between 2200 and 1400 BCE. Constructed of terra cotta, these ancient mains supplied water to the Palace of Knossos. In fact, the ancient Minoans were incredibly advanced for their time, as they also had flushing toilets, sewer piping and drainage, and even rainwater harvesting capabilities. Amazingly enough, the water mains of Knossos were over 1,000 years ahead of their time, as there is no historical evidence of any other water mains until the time of the Roman Empire, between 312 BCE and 500 AD. 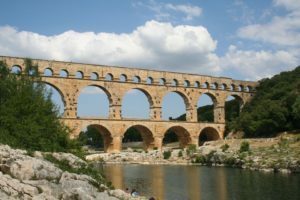 The Roman Empire saw a time of incredible engineering achievement, including the invention of concrete, the construction of bridges and roads, and of course, the innovation of the famous aqueducts. Using gravity to transport water from the outlying hills to the city, these aqueducts, the longest of which was 57 miles, were an incredible engineering accomplishment — and some still stand today. During the early years of the Roman Empire, only the very wealthiest of Romans had water piped directly into their homes via rudimentary water mains, which were constructed of hollowed out logs or drilled stone. Later, water was piped to additional affluent homes via lead pipes. While some argue that the fall of Rome can be attributed to lead poisoning, there is no hard evidence that this theory is true. Wooden pipes were used in 16th and 17th century Europe, and in 18th and 19th century Canada and United States. To this day, wooden pipes are occasionally unearthed during construction events in Boston, Massachusetts. Wooden pipes did present some problems in that they tended to attract insects and to rot. Also, they imparted a distinct woody flavor to the water. In the 1800s, lead pipes came into popularity due to their durability and low cost. However, it was eventually recognized that lead water mains were causing lead poisoning, and by the 1920s, an increasing number of municipalities were prohibiting the use of lead pipes to convey drinking water. Long before Flint, Michigan, one of the worst lead poisoning disasters took place in Lowell, Massachusetts in the 1890s, where some of the drinking water tested contained 1,300 times the current EPA drinking water standard. Werner Troesken, an economist at the University of Pittsburgh, authored an entire book about widespread lead poisoning in turn of the century America from lead water mains. Advanced Condition Assessment for Pipeline Rehabilitation helps determine which pipes in a water distribution system are in need of rehabilitation or replacement. Because lead pipes were recognized to have negative health effects, cast iron water mains because the popular choice in the early 1900s. In use sporadically since 1455 when Germany laid the first recorded cast iron water main in history, cast iron offered a strong, durable, and safe means by which to convey water. Many municipalities on the east coast of America still have cast iron pipes in place that were laid over a century ago. Since their useful life expectancy is 75-125 years, many of these cast iron mains are nearing the end of their useful life or are overdue for replacement. Unfortunately, universal replacement of these failing mains is impossible due to the sheer volume of outdated mains combined with the shrinking budgets and increased regulations that municipalities are currently facing. Therefore, many municipalities are turning to more methodical means of determining which mains should be replaced, such as Advanced Condition Assessment for Pipeline Rehabilitation, which determines the amount of useful life left in a main, and Capital Efficiency Plans™, which identify areas of water systems most in need of rehabilitation, repair, or replacement. Systematically determining utilities’ most critical needs enables efficient use of their limited infrastructure dollars. One of the most important modern innovations in water supply is the development of ductile iron in 1948. First used commercially in 1955, ductile iron main is still used today and boasts the longevity of cast iron pipe with the additional benefits of increased flexibility and strength. 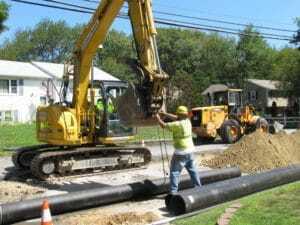 In addition to ductile iron, modern day water mains are also constructed from polyvinyl chloride (PVC) plastic pipe. Many advances have been made in the conveyance of water since the early days of the Minoans, with several major innovations occurring during the last century. Building on historical knowledge as well as an ever increasing understanding of water chemistry, toxicology, and engineering, water distribution methodology is likely to continue to evolve in ways that will ensure our water is safe, clean, and abundant for future generations. This week, May 3-9, is Drinking Water Week 2015, which is sponsored by the American Water Works Association (AWWA) and themed “What do you know about H2O?” Water is essential to life, and is the mainstay of civilization. 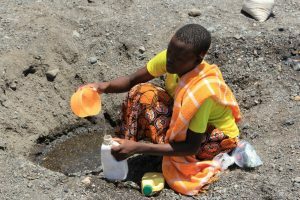 People need water every single day not just for drinking, but also for industrial, agricultural, medical, and recreational needs. Reliable access to clean, safe water is critical to the health and success of society. Drinking Water Week encourages the public to get to know their H2O and to understand how crucial water is to our daily lives. And while we have written about many water issues including sustainable development, water conservation, water reclamation, the criticality of water, where our water comes from, and the criticality of investing in our nation’s aging infrastructure, there is a constant: America has one of the safest drinking water supplies in the world, and in fact boasts 100 percent access to clean water and improved sanitation. So this week we’d like to take a step back in time and learn about the history of water distribution and sanitization. Since the beginning of civilization, access to ample water has been paramount. Around 3100 BC, the first historically accepted civilization of people settled in Mesopotamia, the land made rich and fertile by the cyclical flooding of the Tigris and Euphrates Rivers. Ancient civilizations were always located near ample water supplies, and even ancient walking paths were routed past springs or streams. Ancients heavily prized any water supply that was clear, clean, and abundant, and the people would often dig wells to make collection easier as well as construct protective structures around these sources. The first engineered distribution system came in the form of “qanats” in ancient Persia, now Armenia, around 700 BC. These qanats, which were open tunnels dug into hillsides, pushed groundwater from the hills to nearby cities or towns. The use of qanats became widespread and some still exist today. In fact, until 1933, the entire water supply of the Iranian capital city of Tehran was drawn from qanats. Next came the Roman aqueducts, which were constructed both above and below ground between 312 BC and 455 AD. 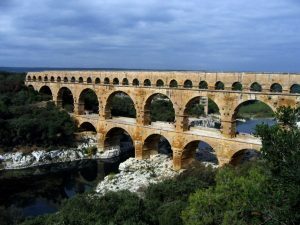 These aqueducts used gravity flow to bring water from distant sources into the cities, and some of these impressive structures are still in existence today. The longest aqueduct was the Aqua Marcia, which brought water from a source 23 miles outside the city of Rome. The actual length of the aqueduct was 57 miles due to its meandering twists and turns along the countryside that were necessary to maintain the steady downhill flow of water. Constructed in 144 BC, the Aqua Marcia was mostly underground. Only the last seven miles of the aqueduct were above ground, ending at Rome’s distribution reservoirs, from which the water was transported to fountains and baths. Only very few wealthy individuals had water piped directly into their homes. Pipes were mostly made of hollowed out logs or drilled stone, but a few were made of clay and lead as well. One of the most wondrous examples of early hydraulic engineering is the Incan “Stairway of Fountains,” built around 1450 at the city of Machu Picchu. The fountains supplied the entire city with fresh springwater from a pair of rain-fed springs atop the mountain. 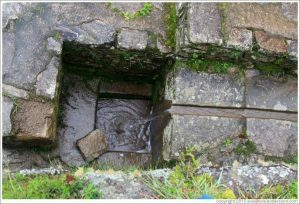 At the main spring, which was a full half mile away from the first of 16 fountains, Incan engineers designed and constructed a 48-foot long permeable wall that fed a stone-lined canal which also collected water from the second, smaller spring. The canal, which was roughly both five inches wide and deep, had an average grade of three percent and could carry up to 80 gallons per minute, which was twice as much water as the peak flow for the springs. 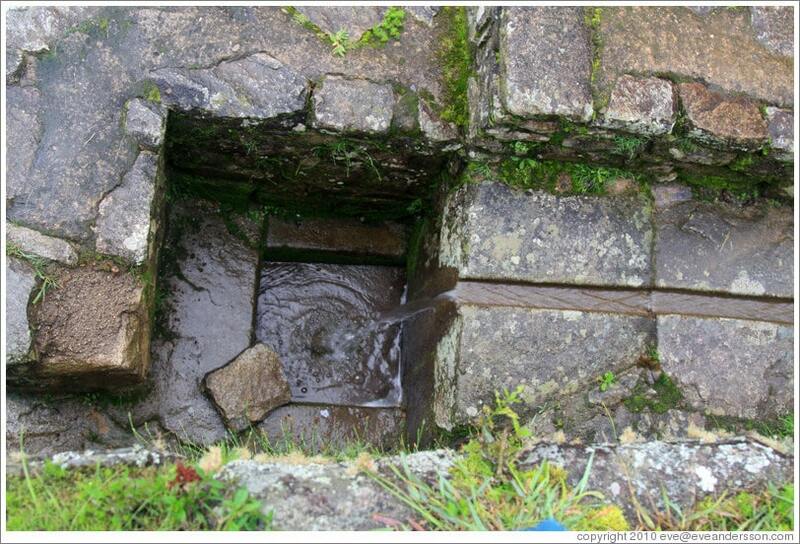 In this way, Incan engineers even prevented overflow and loss. The water flowed to the fountains, which were linked by stone channels that formed a 180 foot long cascade of water, or “water stairs”, with a total vertical drop of 65 feet. All of the fountains, even the emperor’s, were publicly accessible save for the last one, which was located inside the Temple of the Condor. This amazing early engineering feat not only provided a safe, dependable public water supply, but also served to protect the hillside architecture from erosion. 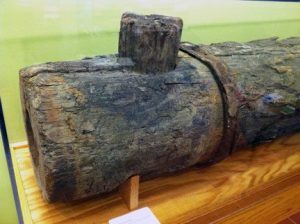 Wooden water pipe, said to have been laid prior to 1800. Unearthed in 1921 from the corner of Chauncy Street and Exeter Place, Boston, MA. Exhibit in the Joseph Allen Skinner Museum, South Hadley, Massachusetts, USA. In 1652, Boston became home to the nation’s first waterworks, formed to provide water for fire-fighting and domestic usage. Fires were a common hazard in that time period of wood-framed homes and fireplaces, and a ready water supply was paramount. 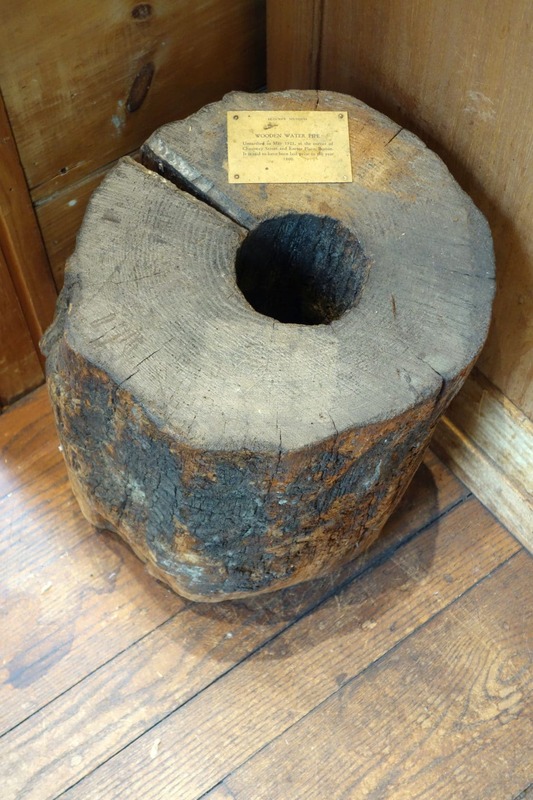 Bored-out logs were constructed from ten-inch thick hemlock or elm trees, cut into seven to nine foot lengths, and attached together with pitch or tar, or sometimes even iron hoops. In Boston, the line supplying the bustling community on the waterfront ran from Jamaica Pond to the Faneuil Hall area. 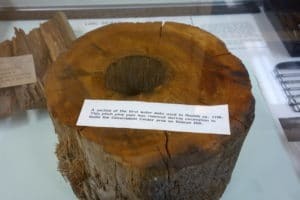 Wood proved problematic for several reasons: uneven ground caused the logs to sag and hold stagnated water, insects infested the pipes, the wood rotted, and the water often tasted woody. In addition, the increased pressure required to pump water into rapidly expanding cities began splitting the wooden pipes. Around this same time, iron became more readily available, and cities began using it in their distribution systems. In 1804, Philadelphia became the first city in the world to utilize cast iron pipes for water mains and the first city to build a large-scale waterworks, which drew from the Schuykill River. New York City followed suit with a water distribution project that consisted of 41 miles of channel with a constant slope of 13.5 inches per mile. Completed in 1842, the project also had 16 tunnels, 114 culverts, and a bridge over Harlem River. Waterworks were dependent on pumps, the first of which were waterwheels and simple hydraulic pumps. By the 1800s, steam powered windmills came into widespread use due to the ever-expanding population and industrial revolution. For example, Chicago’s population was 350 in 1835. By mid-century, it had soared to more than 60,000 people! And in 1869, Chicago made worldwide newspaper headlines when it unveiled its incredible engineering feat. 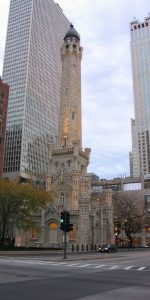 The Chicago Waterpower utilized twin underground tunnels to supply the city with water. The first tunnel contained a 138-foot tall, three-foot wide standpipe that equalized pressure in the city’s mains. The standpipe survived the Great Chicago Fire of 1871 and still stands today as a historical structure. Steam-driven engines drew water from Lake Michigan and provided 15 million gallons per day to the city’s water mains. Today, six engines pump 72.5 million gallons per day to the city of Chicago, and more than 90 perent of the U.S. population is supplied water from municipal supplies. Civilizations have understood the necessity for both dependable water supplies and water treatment for over six thousand years. Ancient Sanskrit texts discuss boiling, sunlight exposure, and charcoal filtering as methods to treat turbidity, or visible cloudiness. Ancient Egyptians even utilized coagulants, which are chemicals still used today to remove suspended particles in drinking water. Greeks and Romans utilized purification methods including sand filtration, water settling, and storage in copper pots. Because ancients had no knowledge of microbes and their only concern was turbidity, no additional progress was made on water sanitation until the 1800s. The single most important breakthrough in water treatment was the understanding that disease is transmitted through microbes in untreated water. In 1804, Paisley, Scotland constructed the first large-scale water treatment plant, which utilized slow sand filtration. 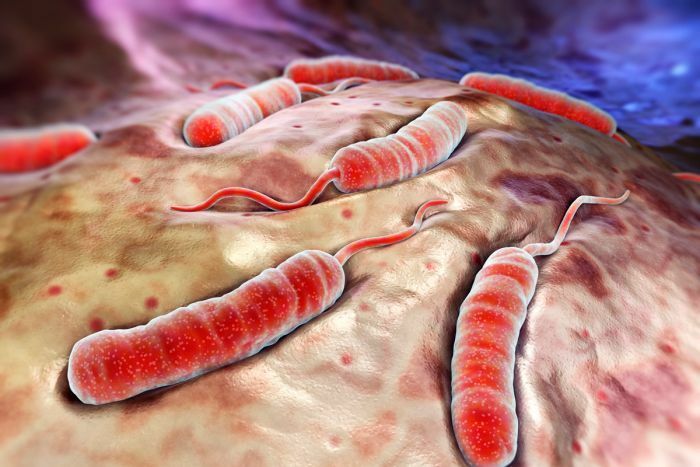 And in 1855, epidemiologist Dr. John Snow proved that cholera was a water-borne illness by linking an outbreak of the disease in London to a public well that had been contaminated with sewage. London started utilizing sand filters for its drinking water and saw a drastic reduction in cholera cases. Later in the 1800s, Louis Pasteur showed how microscopic organisms, or microbes, transmitted disease through water — the “germ theory”. The discovery of chlorine as a microbicide revolutionized water treatment. Maidstone, England was the first city in the world to treat all of its water supply with chlorine, and Jersey City, New Jersey was the first city in the United States to disinfect public water using chlorination in 1908. Starting in 1910, routine chlorination became widespread in the United States, and over the next few decades, the country saw a drastic reduction in typhoid fever deaths. Thanks to the Safe Drinking Water Act, virtually all water in the U.S. is now treated to stringent drinking water standards. The U.S. Public Health Service implemented the first regulation of drinking water quality in 1914, and it only applied to contaminants capable of causing contagious disease. The Public Health Service revised and expanded these regulations in 1925, 1946, and 1962, the latter of which was adopted by all 50 states and encompassed 28 substances. By the late 1960’s, however, it became apparent that additional oversight was needed. Now not only were aesthetic problems, pathogens, and naturally occuring chemicals a concern, but also man-made toxins and chemicals caused by the industrial and agricultural advances of the time. Factory discharges, farm and field runoff, and leaking underground storage tanks were leaching chemicals into the drinking water supply, causing health and environmental concerns. The Public Health Service conducted a survey in 1969 that had some sobering results: only 60 percent of the nation’s water systems delivered water that met the Public Health Service’s standards. In addition, a 1972 study found 36 chemcials in treated water taken from treatment plants along the Mississippi River. These studies, along with an increased awareness of the environmental impact of industrialization, led to the passage of several environmental and health laws, including the Safe Drinking Water Act in 1974. Amended in 1986 and 1996, the Safe Drinking Water Act is now under the administration of the U.S. Environmental Protection Agency’s Office of Ground Water and Drinking Water (EPA). One of the most important results of the Safe Drinking Water Act is the improvement of water treatment in small communities. Prior to the passage of the Act in 1974, only 33% of small to mid-sized communities provided any treatment at all. Today, nearly 100% of communities in the nation are supplied with drinking water that meets federal drinking water standards. A woman scoops unfiltered water from a dry riverbed near Kataboi village in remote Turkana in northern Kenya. Safe, clean, and reliable drinking water is crucial to civilization and humanity, and we are fortunate to live in a time — and country — where drinking water is plentiful and safe. Unfortunately, the same does not hold true for the rest of the global population, with almost a billion people still without access to clean drinking water. 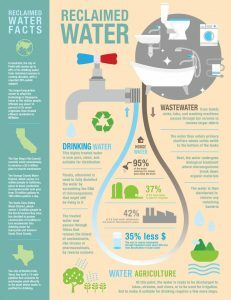 So while we celebrate the impressive historical timeline of advancements in both distribution and treatment during Drinking Water Week 2015, we must all continue on the path of innovation until the global population’s water needs are met as well. Happy Drinking Water Week 2015!